This is one of the better articles I have come across. This information has been “out there” for a while but this author sums it up so well. It is very much worth the read. As a registered nurse I have noticed the increased incidence of gluten intolerance, other gastrointestinal disorders and obesity. It is not necessarily about how MUCH people eat, though that certainly IS a factor, but WHAT they are eating. I witness on a daily basis the increase in Autoimmune type disorders and neurodegenerative diseases such as Multiple Sclerosis and Alzheimers disease as well as Autism. Frankly, I DO believe everything in our environment is factoring into these such as the glyphosates we ingest, Geoengineering of the Weather using nano metals as in aluminum, as well as the toxins in Vaccines. We are living in a toxic soup of chemicals and metals and the long term effects are manifesting in our bodies. Daily detox is imperative as well as avoiding as much as possible the glyphosate they are intent on poisoning us with. Continue voting with your wallets because I think THAT is what these corporations understand… the almighty dollar. The bad news is that the problem lies with the manner in which wheat is grown and harvested by conventional wheat farmers. According to Dr. Stephanie Seneff of MIT who has studied the issue in depth and who I recently saw present on the subject at a nutritional Conference in Indianapolis, desiccating non-organic wheat crops with glyphosate just before harvest came into vogue late in the 1990’s with the result that most of the non-organic wheat in the United States is now contaminated with it. Seneff explains that when you expose wheat to a toxic chemical like glyphosate, it actually releases more seeds resulting in a slightly greater yield: “It ‘goes to seed’ as it dies. At its last gasp, it releases the seed” says Dr. Seneff. “I have been a wheat farmer for 50 yrs and one wheat production practice that is very common is applying the herbicide Roundup (glyposate) just prior to harvest. Roundup is licensed for preharvest weed control. Monsanto, the manufacturer of Roundup claims that application to plants at over 30% kernel moisture result in roundup uptake by the plant into the kernels. Farmers like this practice because Roundup kills the wheat plant allowing an earlier harvest. Using Roundup on wheat crops throughout the entire growing season and even as a desiccant just prior to harvest may save the farmer money and increase profits, but it is devastating to the health of the consumer who ultimately consumes the glyphosate residue laden wheat kernels. The chart below of skyrocketing applications of glyphosate to US wheat crops since 1990 and the incidence of celiac disease is from a December 2013 studypublished in the Journal Interdisciplinary Toxicology examining glyphosate pathways to autoimmune disease. 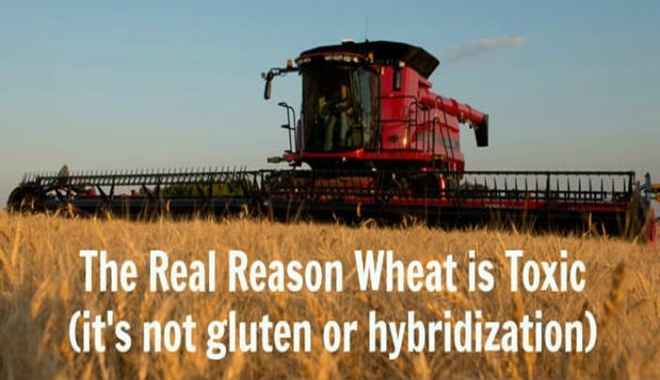 Remember that wheat is not currently GMO or “Roundup Ready” meaning it is not resistant to its withering effects like GMO corn or GMO soy, so application of glyphosate to wheat would actually kill it. But, if you aren’t celiac or gluten sensitive and would like to consume this ancestral food safely, you can do what we do in our home. We source organic, naturally low in gluten, unhybridized Einkorn wheat for breadmaking, pancakes, cookies etc. Please note that einkorn is not to be confused with the more general term farro, which includes emmer and spelt, which are both hybridized. You can learn more about the scientific research on the “good” gluten in einkorn in this article. When we eat out or are purchasing food from the store, conventional wheat products are rejected without exception. This despite the fact that we have no gluten allergies whatsoever in our home – yet. UPDATE: The Soil Association in July 2015 called for an immediate ban on the use of glyphosate for wheat ripening and desiccation purposes. The nonprofit reports that glyphosate residues are widely found in nonorganic wheat samples and the use of the herbicide on wheat crops has increased 400% in the past two decades. Dr. Robin Mesnage of the Department of Medical and Molecular Genetics at Kings College in London, revealed new data analysis showing Roundup, the most common brand of Glyphosate based herbicides, is 1,000 times more toxic than genotoxic glyphosate alone due to the inclusion of other toxic chemicals in its mix.